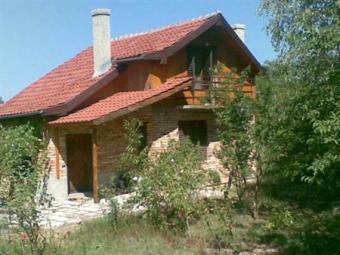 Description: The house is located 55 km away from the coastal town of Varna and 32 km from sandy Beaches. The village is quite big, there is a regular bus transport to Varna and it has all the necessary amenities, such as: a pub, a post office and shops. The village is surrounded by lovely nature, there are some big lakes within 10kms. The house is brick-built and comprises an open-plan living room, kitchenette, a bathroom, a WC and a panoramic bedrooms on the second floor. It is solidly built but requires some renovation works. All essential services such as electricity and water supply are connected. There is a good asphalt road that makes the property accessible all year long. The garden is 1000 sq m and is ideal for building a swimming pool and a barbeque area. The garden is planted with trees, vineyard and is cultivated. You will be charmed of the beauty and tranquility of this place which is ideal not only for rest and relaxation but also for all year living. For nature lovers, fishing and hunting enthusiasts or for those just wanting to escape to the fresh air and peace of the countryside this village is unbeatable !